We recommend that you download and install Google Maps on your mobile device. It will allow you to navigate Tajimi off-line, give you access to our VR images, and more! Choose a piece of white cloth of your choice and draw your painting on it freely. 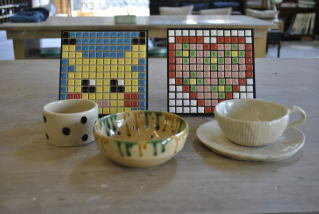 Using a transfer sheet, you can then paste the cut-out-like result on a ceramic object, a plate for example. Reservation is required if you are more than 5 people. 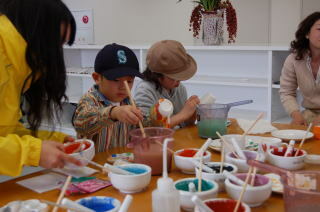 We provide several kinds of experiences in the painting studio inside the Children's Pottery Museum. Groups of small children are welcome. A classroom provided by the Kobe-Gama, a facility with over 200 years of open-kiln history. 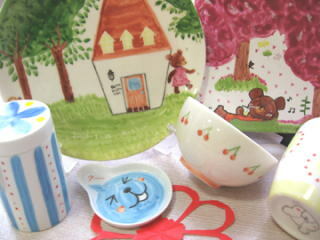 Pick a tea bowl or tea cup, and draw an underglaze decoration with a brush. We also provide a tile art experience using 16 color mosaic tiles from the local town of Kasahara, where you can create your illustration in a frame. No experience is required, feel free to join us, whether you are adults or children. 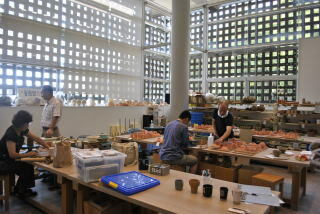 ​Painting experience provided in our large ceramic arts facility - the Ceramic Park - with museums and restaurants. Painting with transfer sheets and pens can be enjoyed easily even by children, as hands and clothes are not soiled. Cut a colorful sheet with scissors into any shape and paste it on the ceramic object, or hand-paint with a pen and burn it onto the object. Groups are welcome (reservation required).